Hot and spicy chilli paneer prepared with this step by step photos recipe is delicious delight anytime. Whether served as starter or served as side dish with Chinese fried rice or schezwan fried rice, it’s definitely going to leave your taste buds wanting for more. 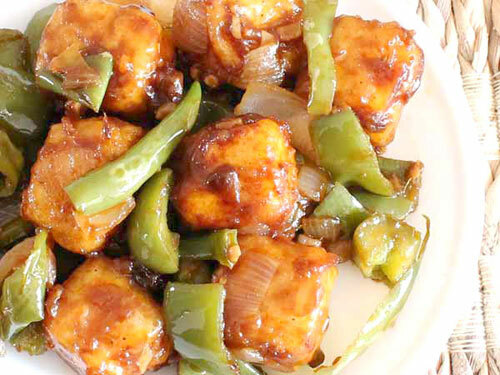 This recipe is for preparing dry Chinese paneer chilly. 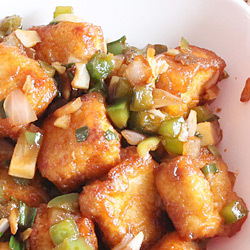 It uses and recommends deep-frying of marinated paneer cubes for best taste but you can follow tips mentioned below to use shallow fry technique and make it a healthy dish. Cut paneer into 1-inch cubes. Make paste (required to coat the paneer cubes) by mixing maida, 2 tablespoons cornflour, black pepper powder and salt with 6 tablespoons water. (use as needed, start with adding 4 tablespoon water and keep adding another tablespoon water until medium thick paste is ready). 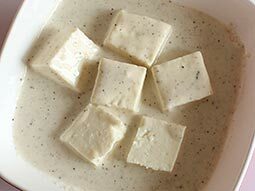 Coat paneer cubes with the paste and set aside for 10-15 minutes to marinate. Heat cooking oil in a kadai over medium flame. Deep fry coated paneer cubes in oil until light brown. Strain them and then put on an absorbent paper (to soak all unnecessary oil) and keep aside until needed. 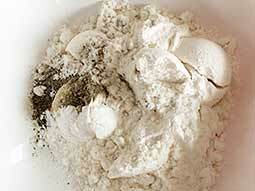 Dissolve 1 tablespoon cornflour in 3 tablespoons water and keep aside. Heat 2 tablespoons oil in a frying pan. Add minced ginger and minced garlic and sauté for 30 seconds over medium flame. Add chopped onion and sauté until it turns light brown. 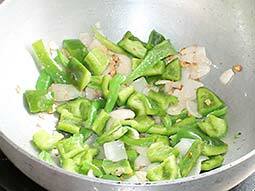 Add chopped capsicum and green chillies and cook for 2 minutes. Keep stirring in between. Add chilli sauce, soya sauce, tomato sauce and salt. Mix well and cook over medium flame for 1 minute. 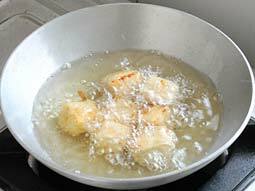 Add fried paneer cubes and dissolved cornflour (prepared in step-5). Stir and cook over medium flame for around 2-3 minutes or until gravy turns thick. 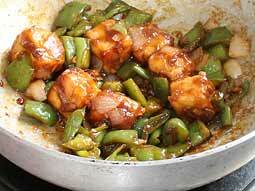 Turn off flame and transfer prepared Chinese veg paneer chilli dry to serving dish. Garnish it with spring onion and serve hot with soup or fried rice. 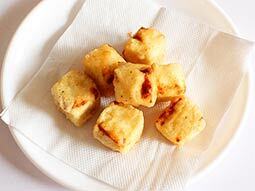 You can also shallow fry paneer cubes instead of deep-frying them to reduce the calories of a dish. To shallow fry them, heat 1-2 tablespoons cooking oil in frying pan and then put marinated paneer cubes in it. Let them shallow fry for few seconds and then turn its side. Follow this step until all sides are shallow fried. Marinating paneer cubes with a paste of maida and cornflour adds nice flavor to this dish as they will slowly soak water from the paste. However, if you are in hurry, then coat them with medium thick paste and directly proceed to deep-fry without waiting for marinating in step 3. 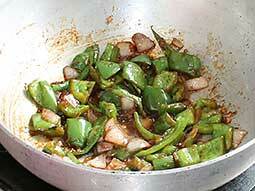 Adjust the quantity of chilli sauce according to your liking to make it as spicy as you want it. Use non-stick pan or heavy based pan to avoid sticking. Serving Ideas: Serve chilli paneer dry with soup in winter evenings to quickly warm up the body or serve it with Chinese fried rice or schezwan rice as a side accompaniment. It was very tasty. My husband said little more gravy will add more taste. What to do to add more gravy? Can I use more cornflour? Response: Yes, add more cornflour and water mixture to make more gravy. I made chilli paneer as your recipe and it was delicious and mouth watering. Thanks. Yummy recipes..I tried it at my home. This recipe was too good ..but can we use potato instead of paneer for chilli potato. Response: Yes, you can use sliced potato instead of paneer. It's delicious in taste. It helped my mom. Thank u all. This recipe has helped in doing my work. It's very easy to make food tasty. Wow... what a delicious chilli paneer you made GUYS. Make more delicious meals forever. Very good I like very much paneer. Hi, I wanted to ask that why didn't you mentioned ajinomoto in your recipe ? Response: Ajinomoto is not goof for health, that's why we have not added in our recipe. Instead of cornflour what should be used to make cheese crispy? Response: Hi Ruchika, you cannot use anything else instead of cornflour (corn starch) in this recipe. Hi, can I use besan instead of cornflour? Response: Hi Sandy, corn flour is used to make outer layer crispy, you cannot use besan instead of it. In very short time I have got really delicious recepie. Your chili paneer dish, I tried at my home, it was very tasty. Hi, I tried. It was yummy but after putting sauce it became dark brown in colour. What to do? Response: Hi Palak, it is normal if mixture turns dark brown after adding sauces, no need to worry. Soy sauce has black color and so the mixture turns dark brown after adding it, as you can see in the steps photo. Thanks for your yummy recipe. My first experience to make this and it was awesome. This recipe is very good but my paneer was not getting a proper and thick coating and when I was frying them, they were sticking with each other. Response: Hi Shalini, thanks for trying the recipe. Mix the batter properly after marination (just before deep frying) to get thick coating and put paneer cubes in hot oil one after another (keeping enough space between them) to prevent them sticking with each other. Thank you so much. Chilly paneer is so yummy. Yummy. Can you post this recipe with gravy? Response: Sure Preeti, we will definitely post the recipe with gravy very soon. It's awesome. I prepared it and it was very good in taste. I liked it. Thank you so much and it was very delicious. Thanks for the wonderful and easy recipe of chinese food. It was yummy and very tasty. Thanks for such a mouth watering dish. Hi, what tomato sauce do you use? Is this ketchup or tomato puree? Response: Hi Nisha, it is ready made tomato ketchup. It was just mouth watering. Tried so many sites, but this one turned out the best. I am glad I found it. Will be trying other things as well. It’s nice and it takes a very short time to make. I just love your finger licking recipie. Which is the best to serve with paneer chilli, paratha or chapati? Response: Hi Hetanshi, chilli paneer tastes best when served alone or with noodles or with fried rice. This will be the next dish I'll be trying out, it looks great. Tip: after I fry the paneer, I put them straight into a bowl of warm water for 5-10 mins. This stops it from drying out. Works with both shop bought and home made paneer. Very good. I love paneer. Nice recipe.Thank you. Thank u so much for too much delicious recipes. I want to confirm that corn flour here means makki ka atta? Response: Hi Khushi, corn flour means corn starch (white color) in this recipe and other manchurian recipes on this website. Makii ka atta is different from the corn flour/starch. You can easily find the corn flour in any grocery store. Response: Hi Mamta, did you use the homemade paneer or store bought paneer? Was the paneer soft before deep frying? I think something was wrong with the paneer you used. Fry the paneer cubes on medium flame to prevent them turning hard. Very tempting and delicious too. i used red chill sauce to make it spicier and it was well worth the change. However, i missed the photos in the print friendly version.